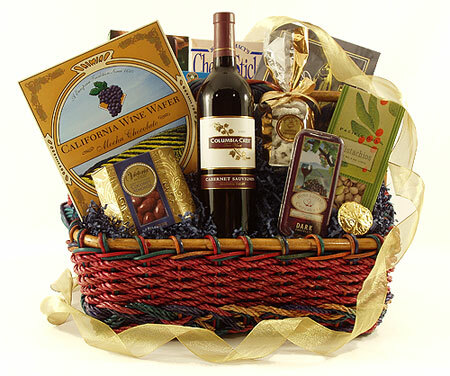 Sure to impress, this beautiful gourmet gift basket overflows with Columbia Crest Cabernet Wine, Portlock's Smoked Salmon, Brie Cheese Spread, Partner's Walla Walla Onion Crackers, Macy's Cheese Sticks, Outrageous Offerings Chipotle Cashews, Adams Place White Chocolate Covered Pretzels, Wine Lover's Chocolates, Chocolate Mocha Wine Wafer Cookies, and Chukar Chocolate Covered Almonds. A memorable corporate gift or a special way to remember family and friends birthdays, anniversaries or housewarming! Available with wine, champagne or sparkling cider.